Very Affordable Quantum At District 19! Proximity to eateries, Hougang Mall, Heartland Mall at Kovan and NEX. One stop community centre at Hougang Avenue 9 offers a plethora of amenities from arts centre, healthcare to eatries. Nestled by the idyllic Sungel Serangoon, you are at one with nature, surrounded by fresh air and botanical scents. A verdant habitat if 9 blocks, tranquility pervades throughout 1157 apartment units, 6 exquisite terrace houses and 2 exclusive semi-detached homes. Where living is a breeze with the presence of 6 retail outlets and a childcare centre within WaterBay brings convenience right to your doorstep. Imagine a classroom without walls at Sungei Serangoon. Thanks to the PUB's Active, Beautiful, Clean Waters (ABC Waters) Programme, residents can now enjoy the "river classroom" experience. 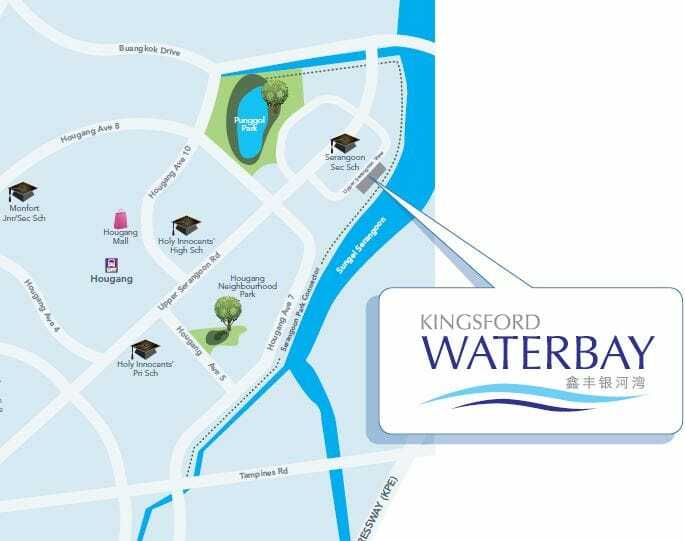 Convenience is larger than life at Kingsford Waterbay: enjoy direct access to the Serangoon Park Connector that connects to other major parks in the North-East Region including the Punggol Park. Other than breathtaking views, the Sungei Serangoon also offers opportunities for water spots and recreation. A development perfectly poised between the serenity of the Sungei Serangoon and the lush acres of garden space and water facilities within. WaterBay is where a life of ease begins. Disguished architecturally by the streamlined form of its nine tower blocks and the stunning facades, Kingsford WaterBay is a statement of who you are. Please contact me @ 8399 7983 or via below for more information on Kingsford WaterBay. Proposed flat development comprising 9 blocks of 16-storey residential with 1157 units of flat/apartment, 6 units of 2-storey strata terrace housing, 2 units of strata semi-detached houses (Total 1165 units), 6 commercial units with 1-storey podium carpark, basement carpark, tennis court, swimming pool, clubhouse, childcare centre & communal facilities at Upper Serangoon View. Schools that is within 1 km from Kingsford WaterBay.